20mm Alternate Shear Insert Router Bit – Solid Carbide Replacement! We are excited to introduce our new 20MM Alternate Shear Insert Router Bit (Part No. 22006). 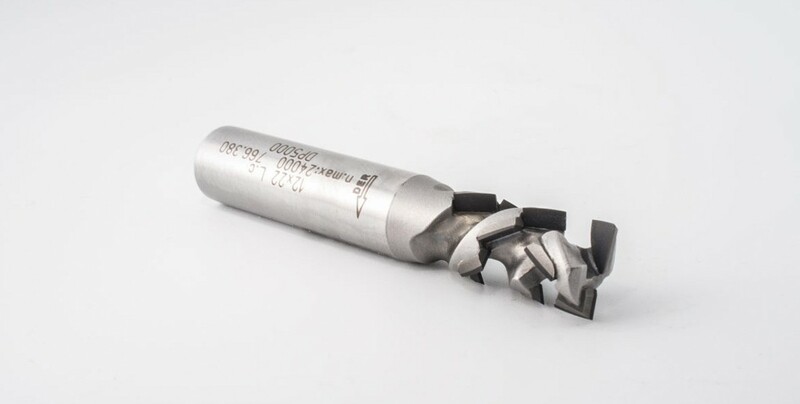 This 2-flute, 20 mm (0.787) diameter router bit is available in a 30 mm (1.180”) cutting length and an alternating shear cutting action. Though not recommended for machining double sided materials, this insert router bit is ideal for perimeter & grooving applications of raw composite (MDF & Particle Board) materials, solid woods and difficult to machine products such as Phenolic and especially solid surface (Avonite, Corian, Wilsonart, Formica & Swanstone). The face-mounted inserts enable a large gullet area which effectively and efficiently evacuates the material chips and aids in the heat dissipation. This is particularly important when machining heat setting materials such as Phenolic and Solid Surface materials. 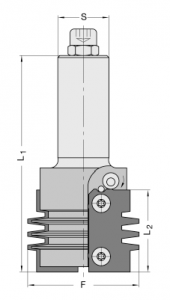 Standard double sided inserts are utilized and depending on the material being machined, are available in two different carbide grades. Reduce your tooling inventory and tooling cost substantially while improving efficiencies with a tool that offers a constant cutting diameter, economical inserts, rigid tool body construction and excellent finish results! When it comes to machining thicker materials and when a larger diameter is acceptable, the series No. 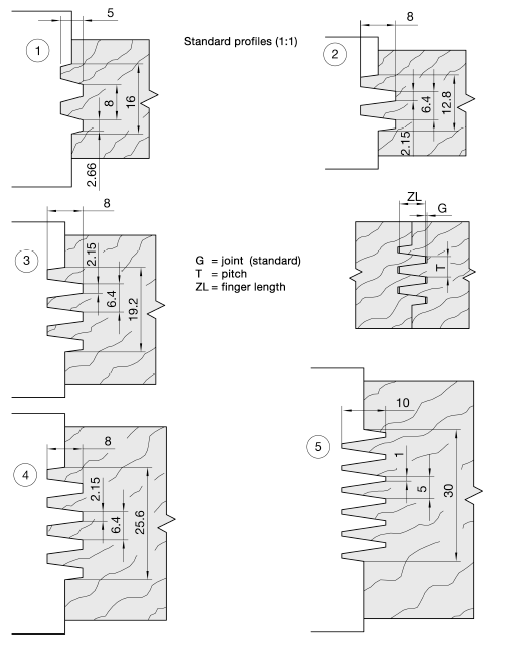 22006 alternate shear insert router bit is an ideal alternative to a 3/4″ solid carbide compression bit. Posted in CNC Router Tooling, Featured Tools, Insert Tooling, Woodworking | Comments Off on 20mm Alternate Shear Insert Router Bit – Solid Carbide Replacement! As an extension of our Rapido profile insert system we offer a standard Rapido profile insert router bit for glue joint operations. Available in a precision ground tool body with ¾” or 25 mm shank, this 2-wing profile insert router bit is designed to produce architectural style glue joints in soft and hard woods. Depending on the material thickness and desired profile, five standard profiles are offered. This tool is ideal for architectural moulding and door and window companies where finger joints are required for producing arched or curved profiles. Reduce your tooling inventory and tooling cost substantially while improving efficiencies with a tool that offers a constant cutting diameter, economical inserts, rigid tool body construction, and an excellent finish result! Interested? Contact us today. The Z-Mill high shear PCD (polycrystalline diamond) router bit is designed for running at high feed speeds while still providing an excellent finish quality. 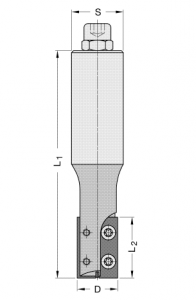 This tool is supplied with a high-density steel tool body and depending on the cutting diameter, is offered with either 2 or 3 cutting wings. What sets this high-performance PCD bit apart from the rest is the 20-degree position of the cutting tips. The high shear angle provides an excellent finish and the durability of the diamond will lead to cost savings when compared to solid carbide over the life of the tool. The Z-Mill is well suited for cutting a variety of materials including MDF, Chipboard, Laminated materials, and both hard and soft wood. The high shear angle offers the benefit of reduced cutting pressure and promises improved results, especially when exiting the material which many times leads to “blow out” . The performance of this tool in terms of speed and finish quality is truly unmatched. Contact us for more information on the Z-Mill and for more information on how PCD can improve your tooling budget.